Our God cares for us so much—His love is everywhere! If He sees one heart in need, His love will be right there. 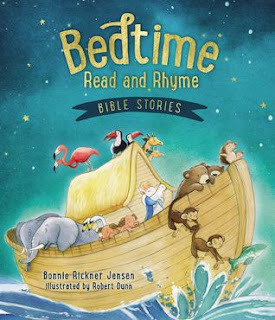 Bedtime Read and Rhyme Bible Stories offers more than 90 stories from the Old and New Testaments told in delightful, rhyming verse, along with Bedtime Prayers that help young readers grasp and apply each message. Tuck in your child with rhyming reminders of God’s great love! This is a wonderful book of Bible rhymes telling the stories we love in a way that will appeal to young children. I loved the colorful and whimsical illustrations and they did a good job depicting what the sweet words were sharing. While I only counted 68 stories rather than the 90 it says in the synopsis (since several took more than two pages) there is still over 200 pages of content and will last a long time as children and adults discover the treasures from the Bible in a meaningful way. Highly recommend and it would make a great gift for children and families!